‘Your wish is my command’ is the new mantra of Twitter that is constantly releasing new features upon the demands and hopes of its users. Matt Navara, a social media expert, commented the same on his tweet and applauded Twitter’s efforts in testing and releasing new features. Although Twitter has already introduced the dark mode just like other apps and services, it looks like the micro-blogging site is looking to enhance the feature with a darker aesthetic for late night tweeting. Additionally, the current dark mode has a bluish hue and the new ‘darker’ mode will turn the background to black and the text from black to white. 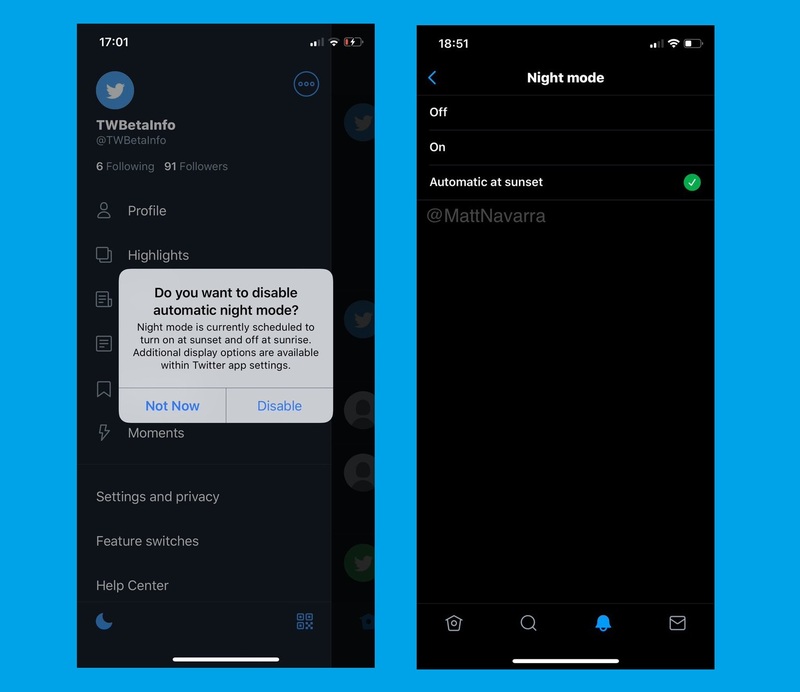 By fixing the dark mode, Twitter aims to make it easier on the eyes of users who are in the habit of reading and posting tweets at a later hour. Moreover, an automatic night mode is also in the cards for Twitteratis. The feature will allow users to schedule the night mode that will automatically begin at sunset and end at sunrise. The feature is in ‘testing’ mode since May of last year and if it ever goes live – the users will be able to send over sensitive information through Twitter instead of going to privacy apps like Signal or Whatsapp. · More options on the side menu including the News, Friends, Highlights, etc. Twitter’s product lead, Kayvon Beykpour also confirmed that some major changes are currently being tested out by Twitter and will be available for the users soon. Read Next: Twitter introduces the long-awaited edit feature, along with multiple other important updates!